This week's tablehopper: beach bummin'. Gringas: al pastor tacos with cheese melted on flour tortillas from the incomparable Mister Taco in Cozumel. Photo: © tablehopper.com. Hola chicos y chicas. Am back from Cozumel, where my sis and I ate all the tacos. Al pastor for the win, again and again and again. We are now hooked on sopa de lima (gonna make it real soon). Piña colada sundowners were a daily thing (so good with a banana whipped in there), and the turquoise water was beyond gorgeous. We cruised around the island in our Chevy rental beater (we called her “La Chevita”), and I actually read a non-food-related book. (It was called China Dolls and was about three Asian women’s experiences in pre- and post-World War II San Francisco. I dug all the historic details about Chinatown and their [fictional] experiences as performers at Charlie Low’s Forbidden City nightclub!) It was a real vacation, and I felt so lucky to have that time to chill out and do things like watch Tequila Sunrise (which our Spanish channel had inexplicably changed the title of into something ridiculous) in bed while drinking crap imported sparkling wine from Germany (it’s all we could find). Just before I left town late Saturday night, yours truly hosted a big invite-only brunch event for 40 people at The Cavalier highlighting Food Should Taste Good chips (maybe you saw some of my pics on social media of the amazing falafel chip shakshuka-meets-chilaquiles?). Chef Jenn Puccio rocked a very tasty menu for us, you can read my event recap here. Baseball season is also here in two weeks, so let’s talk about hot dogs. Here are four new hot dogs you can get around town. We have a lot of news to catch you up on here—Dana and I have been typing like madwomen for the past two days—so let’s get to it! See you on Friday. A tabletop (with the awesome mural). Photo by Darren Samuelson. If today’s final inspection goes as planned, ~ICHI KAKIYA~ should be opening its doors this Friday for a soft opening. Chef-owner Tim Archuleta and partner Erin Archuleta (who was tablehopper’s very first intern, awww!) of ~ICHI SUSHI~ are opening in their original Ichi location, one that was built to be a raw bar until their busy sushi business outgrew the space. The name means “oyster shop” in Japanese, and it’s not the only thing this 21-seat place will offer. There will be five kinds of sustainable oysters, both local and from Japan, along with clams and scallops (both from the East Coast and beauties from Hokkaido). Other dishes on the opening menu include Japanese potato salad, a salad with yuba and green olive dressing (want! ), house-cured ocean trout, a dish with housemade kimchi and asari clams, and some steamed selections, including shrimp, mussels, and a half crab. Hot picks include a seasonal soup (like kabocha) and miso-marinated cod. Dishes will be different than what you’d find at Ichi, so don’t expect to find any favorites on the menu. Time for new favorites! The spot is no reservations (remember, it’s 21 seats, with 12 at tables and 9 at the counter—plus there’s a small waiting counter in the front), and will be a fun spot to swing by for a dozen oysters and glass of bubbles, or you can turn it into a full meal. Speaking of bubbles, they will be the primary focus of the wine menu, plus some whites and a rosé will be available. There will be local and imported beer, from Almanac to HenHouse to some Japanese selections, plus four sakes. Space is a premium at this tiny spot, so they have to keep the list tight. Like at Ichi, they brought on Erik Marinovich to do another custom mural for them. It’s a beaut, with an abstract design of oyster shells (look for the pearl) over a cerulean blue backdrop. The overall space is more a sister than a brother to Ichi, with a slightly feminine style, a subtle tip of the cap to ama, the (typically) female free divers in Japan who dove for pearls, oysters, and shellfish. We’ll keep you posted on the exact opening date, and you can always follow Ichi Kakiya on Facebook and Twitter. Hours will be the same as Ichi: Mon-Thu 5:30pm-10pm, Fri-Sat 5:30pm-11pm. 3369 Mission St. at Godeus, 415-814-3877. The interior of Aster. Photo by Michael David Rose, courtesy UrbanDaddy. A dish at Aster. Photo from Brett Cooper’s Instagram feed. Before we took our little break, we posted an update about Brett Cooper’s new restaurant in the Daniel Patterson Group, ~ASTER~. We just wanted to alert you that it’s officially open, and the menu is live on the website. Dishes include smaller bites like nori puffs with cauliflower mousse and burnt honey vinegar ($6), green garlic “vichyssoise” with a soft egg, olive oil crouton, and pecorino ($13), and larger plates, including black cod with chard leaves and pickled stems, miso levain, and smoked cod broth ($33). Nope, no shortage of creativity from this chef, who I first met when he was working as a sous for Stuart Brioza at Rubicon. He then made his way to Coi, and was chef de cuisine at Saison and executive chef of Outerlands. Like we mentioned in our previous piece, his sous chef is Meghan Clark (Delfina, Aziza, Spoonbar, and Kin Khao) and his pastry chef is Sean Ehland (formerly the executive pastry chef at McCrady’s in Charleston)—this neighborhood restaurant has quite a team. Look for a tasting menu to come soon. Hours are Sun-Thu 5:30pm-10pm, Fri-Sat 5:30pm-10:30pm. 1001 Guerrero St. at 22nd St. The light-filled front lounge area. Photo: Douglas Friedman. The dining room at BDK. Photo: Douglas Friedman. Last month we mentioned ~BDK RESTAURANT &AMP; BAR~ was opening in the former Grand Cafe in the Hotel Monaco, with chef Heather Terhune (previously Chicago’s Sable Kitchen & Bar). She has put together an American menu with some fun updates, like bacon croutons in an iceberg salad, and avocado and Calabrian chile in the steak tartare. The braised lamb poutine and smoked ham and Brie pop-tarts also sound like good trouble. Mains include pickle-brined fried chicken thighs with coleslaw and mini buttermilk biscuits ($22), spaghetti and meatballs ($21), and I am all over the potato and cheese pierogies ($19) with caramelized onions, sour cream, and dill. The space got a big refresh from design firm Ken Fulk Inc. (Marlowe, The Battery), and now has an energetically patterned tile floor, leather banquettes in dark butterscotch, and stylish dining room chairs. The dining room has 72 seats (with high-top tables and pub-style booths and banquettes), and there is still a spacious bar and lounge area, with 17 seats at the California granite bar and 20 seats in the lounge. The huge dining room has been converted back to its original ballroom state (it was the grand ballroom of the Bellevue Hotel in the early 1900s). Bar manager Kevin Diedrich is behind the cocktails (which run for $11-$12), and the wine list will emphasize Chianti (seems Bill Kimpton, the man behind the BDK initials, was a fan). You’ll find wine, beer, and Diedrich’s spin on an old-fashioned all on tap. Hours are breakfast: Mon- Fri 7am-10am, Sat-Sun 7am-10am; dinner Sun-Thu 5pm-10pm, Fri-Sat 5pm-11pm. Bar open daily at 4pm. Brunch is coming soon. 501 Geary St. at Taylor, 415-292-0101. The beautiful jewel box of Bar Jules. Photo from Facebook. 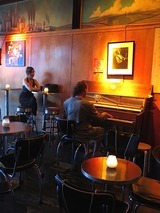 Hayes Valley mainstay ~BAR JULES~is closing, according to Scoop. Owner Jessica Boncutter says the restaurant is doing well, and there isn’t really any issue or drama causing the closure, which has been open for eight years. “It’s nothing financial. Just a decision of mine,” she is quoted as saying, which would seem to tie in to the fact she is eight months pregnant. She mentions that she wanted to sell it to a buyer who would respect the restaurant’s space and spirit. No word yet who that might be just yet, but apparently that news is coming soon. Bar Jules’ last day is this Sunday April 5th. A lot of diners will be crying into their burgers and baked eggs this week. Best to Jessica and her baby! A booth at Hapa Ramen. Photo by Erin Conger. While I was stuck sitting on the tarmac for a couple hours in Cozumel on Saturday (fun times, thanks United), I checked in on Twitter and read the “whoa, dude!” news that chef Richie Nakano was no longer a part of ~HAPA RAMEN~, his project that he has built up over the past five years, finally consummating in a brick-and-mortar location that opened four months ago in the Mission. Unfortunately Nakano was at odds with his business partner, tech investor Owen Van Natta (who owns Hapa Ramen and the brand—it ends up Nakano sold it in July 2014 for $20K) and director of operations Deborah Blum (who is working with Van Natta on the upcoming Citizen Fox), and the wheels obviously came off the bus. What has followed is a #hapagate level of social media posts about the shituation, and it’s hard to tell in publicized laundry-airing like this what exactly went down: was Nakano fired, did he quit, were his food costs too high, were management demands unreasonable? Both sides have their versions. What we do know is Hapa Ramen is now closed, and the partners have other plans for the space. (They have a full liquor license, so you know they’re going to put that to work.) It’s tough for the Hapa Ramen crew who decided to leave, but hopefully they all land somewhere soon. As for the ones who stayed, in a statement by Blum and Van Natta, they say: “Hapa staff was not fired. All but two of Hapa’s line cooks are currently employed by the business; today they’re doing prep work for a tasting related to the concept that will replace Hapa. The management also extended an offer of income to Hapa’s top servers and the kitchen staff to support them during the restaurant’s period of closure.” Again, who really knows. You can grab your bag of popcorn and read more here and here. 2293 Mission St. at 19th St., 415-202-6333. Put a knife in it: the chicken amaranth waffle at Reverb. Photo by Carmen Troesser. After naming a new chef last month, it looks like the former Verbena has also changed its name and look to go along with the new chef and menu. The restaurant is now called ~REVERB KITCHEN &AMP; BAR~ and is intended to be a more approachable, neighborhood spot. The menu hits all the current SF marks, with dishes like caramelized heirloom carrots, grilled octopus with gigante beans and romesco sauce, a kale salad, and a burger. They are also serving brunch on weekends—check out the brunch menu here. The beverages are also intended to be more approachable, with a wine list focused on small producers. The cocktail menu offers craft cocktails like the Clearer Conscience (gin, cucumber, housemade thyme-galangal syrup, and dry vermouth) and Tikal (mezcal, tequila blanco, pineapple, celery, quinquina, dry sherry, and lemon), along with classics like the Martinez and the Negroni. There are special brunch cocktails as well, including a Bloody Mary and Angostura fizz. Hours are daily for dinner 5:30pm-10pm and brunch Sat-Sun 10am-2:30pm. 2323 Polk St. at Union. Outdoor patio at The Yard. Photo courtesy of The Courtyard’s Facebook page. Pepperoni, baby. A pie from Tony’s Coal-Fired Pizza & Slice House. Photo via Facebook. Can you smell that? Yeah, it’s the smell of baseball in the air, and with the season starting again, there are some new additions near the ballpark that you can check out. First up, there’s ~THE YARD AT MISSION ROCK~—which is kind of like an 18,000-square-foot version of Proxy in Hayes Valley—featuring an Anchor Brewing beer garden (16 taps! ), repurposed shipping containers with various vendors (both food and retail), and events too (follow along on Facebook for updates). It’s located in Giants Parking Lot A, and is open daily and year-round, with hours extended for game days. Be sure to keep your eyes peeled for The Whole Beast, which has its own container next to the Anchor Brewing beer garden area, serving chef-owner John Fink’s insane lamb gyro, plus a Wagyu beef brisket sandwich, smoked pulled-pork sandwich, and his poutine returns (!! )—fries with lamb gravy, smoked lamb, and sheep’s cheese. And there’s a vegetarian version too. You can wake up from your food coma with some rocket fuel from Peet’s Coffee (open at 7am daily), and there’s also the Courtyard from Off the Grid, featuring a couple of food trucks, a Humphry Slocombe ice cream cart, and even wine. Off a Wine Bus. Which also has a seafood menu, FYI, with dishes like Courtyard Chowder with bacon gremolata, yes please. Open 11am-8pm daily. 3rd St. at Terry Francois Blvd. Just as we were leaving, we heard some gossip that Tony Gemignani is going to be opening another ~SLICE HOUSE~, this time in the spacious Ironside location, which is now closed. Look for an opening in a couple of weeks. Scoop added that he will additionally be serving calzone, stromboli, and pasta, with a focus on pasta made with ancient grains. 680 2nd St. at Townsend. Quick reminder: if you’re going to the Giants exhibition games, you can order subs from ~MERIGAN SUB SHOP~ and they’ll have them ready for you for a quick pickup. Game season means Merigan’s hours are extending to Mon-Fri 8:30am-7pm (you know they do breakfast, right? ), Sat 10am-4pm, and open on Sundays for Giants home games. A mega feast at Mekong Kitchen. Photo from Facebook. After Eater reported the story back in February, there’s an update on the former Urban Picnic space in the Castro. Urban Picnic closed last month, after less than a year in business, and now owner Trang Nguyen is reopening it as ~MEKONG KITCHEN~. Chef Tim Luym has been brought on, and the menu offers lots of Vietnamese classics, with additional items to take it up a notch, like marbled tea eggs and oxtail soup. The food photos on their Facebook page are straight-up drool-worthy, and Luym always delivers the mega-flava, can’t wait to check this one out. Hours are Tue-Thu 5:30pm-10pm, Fri-Sat 5:30pm-11pm, Sun 5:30pm-10pm, closed Mondays. 4039 18th St. at Hartford, 415-346-9700. ~IZA RAMEN~, which has been popping up in the Mission for about a year now, is headed into the Dante’s Table space in the Castro. According to liquor license activity and a tweet, Iza has nailed a permanent home for their popular noodles. No word on quite when Iza’s noodles will be ready for slurping, but hopefully soon. 544 Castro St. at 18th St., 415-285-3848. Pork belly at Precita Park Café. Photo from Facebook. There’s a new pair of chefs at neighborhood favorite ~PRECITA PARK CAFÉ~, Chris Seyersdahl (Nopa, Café Claude) and sous Richie Wilim (Charlie Palmer Group in New York). Owners Rachel Herbert and Dana Oppenheim want to push the restaurant’s menu in a more adventurous direction, and Seyersdahl has been experimenting with new menu items. He’s been working on gluten-free breads, housemade pastas, and a wild-sounding Sightglass-infused barbecue quail stuffed with housemade chorizo mac and cheese. Some offerings on the current menu include savory pie with fava leaf pesto, shaved asparagus, black trumpets, chicories, and Parmesan; and apple and ginger braised pork belly, lacopi butter beans, black trumpets, spinach, black garlic soubise, and housemade kimchi. Sustainable ingredients and local purveyors are a big part of the new focus. 500 Precita Ave. at Alabama, 415-647-7702. Bernalwood caught the news that there is a new Japanese-style curry house coming to Bernal, called ~FUMI CURRY HOUSE~. It’s moving into the former home of Eagle Donuts, on Mission Street. The space is currently under construction, with an anticipated completion date in a month or so—but the opening could take longer, depending on permits. 3303 Mission St. at 29th St.
Noodle soup from Lanxang Kingdom. Photo from Facebook. ~RUSTY’S SOUTHERN~, which we reported on a couple of weeks ago, is now open in the Tenderloin. They’re serving barbecue plates, fried chicken, and other Southern dishes inspired by the Carolinas. 750 Ellis St. at Larkin, 415-638-6974. Yelp reports are coming in that there’s a new burger place in the Inner Richmond, called ~BUZZ~, in the former Midori Sushi location. They offer grass-fed burgers with interesting topping combinations. There are also several varieties of fries (think sweet potato and garlic), as well as smoothies. 3420 Geary St. at Commonwealth. 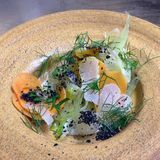 It can be hard to find Laotian food in San Francisco, but Eater reports that a new pop-up at Turtle Tower’s Tenderloin location is going to change that. 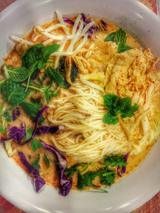 ~LANXANG KINGDON~ will be serving Laotian dishes every Thursday from 11am to 9pm, including weekly specials. The menu includes some unusual dishes, including a snail stew and fried silkworms, alongside a great selection of Laotian salads, noodles, and other dishes like an omelet and a housemade noodle soup. 645 Larkin St. at Ellis, 415-874-5578. Financial District soup wonder ~SOUP JUNKIE~ is moving to a new, larger location on Montgomery Street. They’ve closed their previous location, and should be opening in the new spot in the next few months, though they are still in the process of getting plans approved with the city. We’ll let you know when they reopen! 100 Montgomery St. at Sutter. And it looks like there is already a take for the former Soup Junkie space, none other than ~SUSHIRRITO~. This will be the fourth San Francisco location for the local chain, fifth including their Palo Alto location. Though The Onion reports that perhaps a similar concept is moving to the East Bay, ha-ha. 388 Market St. Suite 107, at Davis. The beginning of spring means the return of ~OFF THE GRID~’s evening Twilight at the Presidio, starting Thursday April 2nd. Every Thursday, catch the food trucks serving all kinds of dishes, along with lit dining cabanas, fire pits, and live music. The variety of trucks will change weekly, and they’ll be on the Main Post Lawn from 5pm to 9pm. Main Post Lawn, at Lincoln Blvd. Star reader Jason B. wrote in to let us know that ~NATIVE JUICE CO.~ is opening in the former Cafe Metropol in the Financial District. According to their website, the juicery closed their location at 250 Montgomery in late January, but will be reopening this spring at 168 Sutter Street. In the meantime, you can also find them at the Oakland Grand Lake Farmers Market on Saturdays and at the San Rafael Farmers Market on Sundays. 168 Sutter St. at Kearny. The New York breakfast of champions. Photo by Nicole Plue (winner of Outstanding Pastry Chef 2010). 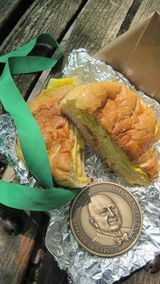 The list of finalists for the 2015 James Beard Foundation Awards was announced while we were away, and we were happy to return and see a pretty strong SF Bay Area showing. Shout-out to Stuart Brioza and Nicole Krasinski, who are up for Best New Restaurant again, this time for The Progress (State Bird won last time). Kudos to Manresa’s Jessica Largey, nominated for Rising Star Chef of the Year. Outstanding Restaurateur nominations include Cindy Pawlcyn (that has to feel good after the rough year she has suffered due to a car accident) and Michael Mina, while William Werner/Craftsman & Wolves and Belinda Leong and Michel Suas (b. Patisserie) are up for Outstanding Baker, and Trick Dog and Bar Agricole are both up for Outstanding Bar Program. It makes total sense Quince would be nominated for Outstanding Service, and fingers crossed for A16 for Shelley Lindgren’s Outstanding Wine Program (meanwhile, Rajat Parr was nominated for Outstanding Beer, Wine, or Spirits professional). Up for Best Chef: West are the unstoppable Stuart Brioza and Nicole Krasinski for State Bird Provisions, plus Matthew Accarrino for SPQR, and Corey Lee for Benu. You can check out all the nominees, which include Restaurant Design, and the Book, Broadcast and Journalism awards, and, of course, Lifetime Achievement, Humanitarian of the Year, Who’s Who, and America’s Classics. Speaking of the James Beard Foundation, their scholarship program is an incredible way for aspiring and established chefs to gain some extra funding to further their culinary education. Know someone (maybe you?) talented who could use some additional support to get the skills they need? Applications can be found right here beginning April 1st, and more information on the different types of scholarships can be found here (and there are some great ones, including international, work/study, and wine-oriented options). Good luck out there, you talented people, you! The interior of the new Equator Coffee & Teas on Market. Photo courtesy Equator. ~EQUATOR COFFEE &AMP; TEAS~ is opening their very first location in San Francisco, downtown in the Warfield building, on Wednesday April 1st. 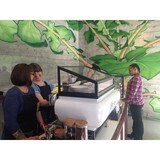 The new café is their third location, after two others in Marin County. The offerings include brewed coffee, cold brew, beer, wine, and espresso. They’ve added some interesting tea items to the menu, too, like honey orchard milk, and tea “squashes,” which are fruit tea sodas. I am particularly fired up for their renditions of the shakerato (brown sugar and cream shaken with espresso), including one that incorporates chocolate and scratch caramel. There are also grab-and-go food options like seasonal salads and parfaits, along with arepa sandwiches with a variety fillings (these are also gluten-free). Check out the full menu here. The space was designed by Boor Bridges Architecture, and features white stone, mahogany, and a mural by artist Mona Caron. Outdoor seating should be coming soon. Hours will be daily 7am-7pm. 986 Market St. at 6th St., 415-614-9129. Pacific Heights may be getting their very own ~BLUE BOTTLE~ location, Scoop reports. According to owner James Freeman, they are looking at the former Tully’s space at the corner of Fillmore and Jackson streets. It’s still going to be awhile, though. 2453-2455 Fillmore St. at Jackson. 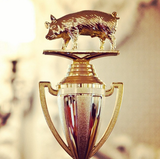 Who will win the pork statue at Cochon 555? Photo from Facebook. Are you ready to go completely hog wild at ~COCHON 555~? (Careful, that link plays some beats.) The festival of all things pork is just around the corner, and the lineup this year is pretty fab. Sunday April 12th at the Fairmont marks the seventh year that five chefs come together to compete for the ultimate in porcine glory: being crowned the King or Queen of Porc. Participating chefs this year are David Bazirgan (Dirty Habit), Robin Song (Hog & Rocks), Salvatore Cracco (Trou Normand), Thomas Kalb (Cafe du Nord), and Evan and Sarah Rich (Rich Table). Each of the chefs will prepare a whole hog menu for attendees and judges, and then voting will determine the winner. The hogs are all heritage breeds from small-scale farmers (including Marin Sun Farms, Front Porch Farm, and Belcampo Meat Co.), to bring attention to the value and importance (and deliciousness!) of responsible ranching. The winner will go on to compete in the national competition in Aspen. In addition to the main event, you’ll find a hog butchering demonstration with Brian Merkel of Belcampo Meat Co.; a station featuring cheeses from Mission Cheese; an oyster shelf; the “Perfect Manhattan Experience” featuring Eagle Rare, Buffalo Trace, Breckenridge Bourbon, Hirsch, and Luxardo; a mezcal bar with chupitos; the tartare bar with Adam Sobel of RN74; and more. Yeah, they are not messing around. Tickets are $125 for general admission, or $200 for VIP, which includes early admission and more drinks and experiences and other good stuff. The event runs from 5pm-9pm for general admission or 4pm-9pm for VIP. The Fairmont, 950 Mason St. at California, 678-744-5886. Cookies at the new B-Side Baking Co. Photo from Facebook. 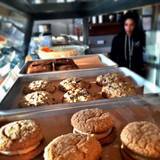 ~B-SIDE BAKING CO.~ from Tanya Holland has opened in the former B-Side BBQ space, according to Scoop. As we reported in February, Holland closed the barbecue spot and replaced it with a bakery from Celeste Scott, the baker at nearby Brown Sugar Kitchen. Each day they will offer a variety of different pastries, like coffee cake, scones, cinnamon rolls, and pies made with seasonal fruit. For now, they are settling in and the space is open daily from 7am to 3pm, but in the coming months the plan is to extend the hours, add additional lunch options, and take advantage of the space’s full liquor license with beverages like Bloody Marys and Irish coffees. 3303 San Pablo Ave. at 34th St., Oakland, 510-595-0227. An offshoot of ~NICK’S PIZZA~ is coming to Temescal, East Bay Express reports. The new location is called ~NICK AND ARON’S~ and comes from Nick’s owner Nick Yapor-Cox and partner Aron Ford, who has been running the morning pastry scene at Nick’s. The new space is in the former Barkada space, which features two huge gas deck ovens in the kitchen and lots more dining space. This will allow the pair to offer a full-service dining experience, with pizza on the menu, of course, but also salads, sandwiches, and other entrées and appetizers. According to Facebook, they officially opened for lunch and dinner on March 27th, with weekend brunch coming soon. 4316 Telegraph Ave. at 43rd St., 510-250-9538. We received word that Linda Bradford, Travis Dutton, and Patrick Lynch, owners of Bar 355, have opened a restaurant next door called ~PARLOUR~. Chef Jason Tuley is using a wood-fired oven for pizzas, as well as other dishes including octopus and meatballs; check out the menu here. The bar offers cocktails, wine, and beer, as well. 357 19th St. at Webster, Oakland, 510-451-1357. The market trend continues, with a new project called ~NEWBERRY MARKET~ moving to Uptown Oakland. The market is moving into the ground floor of Uptown Station, a seven-story 400,000-square-foot retail and office building opening in the former Sears building. Newberry plans to open in summer 2016, with organic groceries and a butcher shop, grab-and-go meals, and household items along with beer and wine. Telegraph Ave. at Broadway, Oakland. Chowhounds are reporting that Korean restaurant ~YU YU ZA ZANG~ has reopened in the former New Ho Ho space. The new space is larger than their previous location, and Yelpers note that the menu has stayed the same, with seafood soup and noodles as a particular standout. 4871 Telegraph Ave. at 48th St., 510-653-2288. The patio at Ziryab, soon to become Horsefeather. Photo from Facebook. We’re getting reports from Hoodline and Eater that Divisadero’s ~ZIRYAB~ is closing. A new bar is moving in from Justin Lew (who has been in the neighborhood for 11 years) and Ian Scalzo, who previously worked with Future Bars (the group responsible for Bourbon & Branch, Rickhouse, and many more). It’s going to be called ~HORSEFEATHER~ and will be a neighborhood bar with a comfortable, welcoming feel. They’re still working out the details (like late-night dining), and their liquor license is still pending. In the meantime, Salim and Sameer Nasser are keeping Ziryab open. 528 Divisadero St. at Fell, 415-522-0800. Hayes Valley’s newest wine bar, ~BIRBA~, is getting ready to open on Wednesday April 1st, Hoodline reports. As reported on tablehopper last April, the new spot comes from owner Angela Valgiusti, who has worked as a sommelier at Slanted Door and wine consultant at Bar Jules. Valgiusti is most passionate about Spanish, Italian, and French wines, so those will dominate the menu. There is also a selection of snacks to pair with the wine, like sausages, pâtés, and tortilla Española. The wines will range in price from $8 to $17, with a house white and red called “hairdresser” wines in a nod to the hair salon next door that has been very supportive of the project. The space is small, with seating for only 16. In the future, Valgiusti hopes to expand into the back garden, though neighborhood concerns about noise mean she’ll have to operate for six months before applying for that permit. The space will also function as a base for Wine Guru SF, her wine consulting business. Hours are Tue-Fri 5:30pm-10pm, Sat 3pm-10pm, and Sun 3pm-9pm, closed Mondays. 458 Grove St. at Octavia, 415-519-5099. Cocktails and live music at the Deluxe, always a pleasure. Photo: © tablehopper.com. I was not happy to return home to the tragic news in Hoodline that Jay Johnson, the owner of Club Deluxe and the Orbit Room, had passed away at the young age of 61 (screw you, cancer). The Deluxe has been such a gem for more than 25 years—I remember going there when the swing scene was running hot in the ’90s, drinking too many martinis, and have always appreciated all the quality live music. The Orbit Room was ahead of its time, back when Alberta Straub was one of the first bartenders to be using fresh ingredients in really unique ways. While I have hated the awkward cocktail tables from the beginning, the vintage vibe paid proper homage to the beautiful space. Sincere condolences to Jay’s family, many friends, co-workers, fellow musicians, and regulars. His contribution to the San Francisco cocktail and nightlife scene was a special one. You can read his obituary here. Happy trails to you. The Sierra Nevada Brewery in Chico. Yelp photo by Loretta B. On Thursday May 7th, chefs from nine Bay Area restaurants will be heading to the Sierra Nevada brewery in Chico for a special collaborative beer dinner in the brewery’s Big Room. Chefs and bar managers will be at the brewery attending “beer camp,” where they’ll be crafting a special beer to serve in their restaurants and will then be sticking around to prepare a six-course dinner. Participants include Jennifer Puccio (The Cavalier, Marlowe, Park Tavern), Stephen Call and Laurence Jossel (Nopa), David Bazirgan (Dirty Habit), and Staffan Terje (Perbacco). They will all work together to craft the dishes for the dinner, which will also be paired with beer, of course. Tickets are now one sale for $100 per person, and the dinner begins at 7pm. 1075 E. 20th St. at Sierra Nevada Ct., Chico. The Easter basket from Miette. Photo courtesy Miette. Spring is here, and with it comes Easter on Sunday April 5th and Passover, from the evening of Friday April 3rd through the evening of Saturday April 11th. Whether you’re planning a brunch out or perhaps a seder at home, or both, we’ve got you covered with handy (and delicious) pickup items, great places to eat out, and festive treats to celebrate the spring season. Local adorable pastry purveyors ~MIETTE~ are offering Easter baskets for sale this year, and they are just as darling as you might imagine. 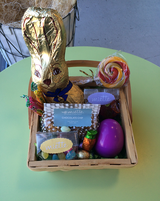 They’re $40 and come with a variety of Miette’s candies, including a chocolate bunny, jelly beans, sour gummies, housemade vanilla marshmallows, chocolate eggs (and carrots! ), and even more. Not only are they supercute, but everyone who purchases a basket will receive an egg with a prize inside. Prizes range from a free ice cream sandwich to a whole cake to a lucky winner who will receive a lifetime supply of birthday cake. So tap into your inner kiddo and go have fun. Multiple locations: Ferry Building and Hayes Valley in San Francisco; Marin Country Mart in Larkspur; Jack London Square in Oakland. Speaking of adorable, these “hopster” bunnies truffles from Recchiuti Confections are ‘hopper approved (for obvious reasons)l. The dapper bunnies in their hats and glasses are just too cute, and they also happen to be delicious, with burnt caramel inside. Order online or pick up at one of their locations. Nothing says Easter like brunch, and ~15 ROMOLO~ has a boozy one planned for Sunday April 5th. Starting at 10am, they’ll be serving five different punches, alongside a “very special” brunch menu. Reservations can be made by email here. 15 Romolo Pl. at Broadway, 415-398-1359. ~A16~ is also getting in on the action, with a regional Italian-inspired menu on Sunday April 5th, available at both brunch and dinner. The special à la carte menu will include dishes like verdetto, lamb braised in white wine with peas and pea shoots. Special dishes will be available 11am-9pm and reservations can be made online or by calling the restaurant. For a family brunch that includes a special menu for kids, check out ~ARGUELLO~ in the Presidio. The three-course menu (two courses for kids) with choices is inflected with Mexican-style dishes like crispy crab tacos and churros con cajeta, and costs $45 per person or $20 per kid. Brunch is served from 11am-4pm. 50 Moraga Ave. at Arguello, 415-561-3650. For a special Easter family supper, check out ~LE MARAIS~, where they will be serving a special four-course prix-fixe meal. From 5:30pm to 9:30pm you can try the special menu for $55 per person, with springtime dishes like a deviled egg with trout, asparagus salad, a choice of entrées, and dessert. Reservations can be made here. 2066 Chestnut St. at Mallorca, 415-359-9801. Celebrate Easter Greek-style with ~SOUVLA~ on Sunday April 12th (the day of the Orthodox Easter). From 1pm to 6pm, the restaurant will be taken over by springtime festivities, including live music and games with prizes, along with traditional foods like a whole lamb roast, kokoretsi (lamb offal), mageritsa (lamb soup), and tsougrisma (red Easter eggs). There will also be lots of desserts and of course plenty of Greek wine and beer. Tickets are $40 for all you can eat and $60 for all you can eat and drink. ~THE PASTA SHOP~ in the East Bay always has lots of items to help with your Passover and Easter celebrations at home. This year, they’ve got their famed hot cross buns, along with quiche, ham, and other take-home items for your Easter dinner or brunch. They can also help you out with Passover, with items ranging from freshly grated horseradish and charoset to a slow-cooked brisket. They also have desserts, including chocolate mousse squares, a springtime pavlova, and, of course, macaroons. Scope the choices here, and then order online for pickup at either their Berkeley or Oakland location. Oakland: 5655 College Ave. at Keith, 510-250-6005. Berkeley: 1786 4th St. at Delaware, 510-250-6005. If you’re planning a seder at home, let ~WISE SONS DELI~ take care of the heavy lifting for you, with their catering menu for Passover. Lots of classics are available, including a seder plate kit, charoset, braised brisket, and potato kugel. They can also help out with dessert, including macaroons and chocolate torte. Find all the details and place your order here. There are also still a few tickets available to their seder at the deli on Monday April 6th. Craig Stoll always celebrates Passover at his restaurants, and this year is no exception. 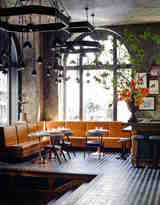 ~DELFINA~ will be offering a daily changing menu from Friday April 3rd to Friday April 10th. Menu options will include the edible seder plate, poached trout with spring vegetables, and leg of lamb. Then, at ~LOCANDA~, you’ll find the traditional Stoll family matzo ball soup (the balls have a walnut in the center! ), made using the wood-fired matzo from Beauty’s Bagels in Oakland. Reservations can be made by calling the restaurants. ~PERBACCO~ is celebrating Passover with their eighth annual dinner celebration with chef and author Joyce Goldstein on Tuesday April 7th and Wednesday April 8th. She’ll be cooking recipes from her cookbook Cucina Ebraica, which celebrates the dishes of Italian Jews. The menu opens with family-style appetizers like fried artichokes and is followed by two courses with choices like lamb stew with green garlic. There will also be side dishes for the table and family-style dessert. Check out the menu here. The dinner is $55 per person, not including tax, tip, or beverages, and reservations can be made by calling the restaurant. Noe Valley’s ~FIREFLY~ is offering a special Passover-inspired menu from Friday April 3rd through Friday April 10th. All the dishes are served à la carte, and the menu includes classics like a starter plate of charoset, matzo, and bagelach, matzo ball soup, and braised brisket, alongside more inventive dishes like a goat cheese soufflé and grilled lamb sirloin. Reservations can be made here or by calling the restaurant. 4288 24th St. at Douglass, 415-821-7652. Berkeley’s ~COMAL~ is celebrating Passover with two seders, one on Monday April 6th and another on Tuesday April 7th. The menu will incorporate Mexican traditions, with dishes like beef brisket in adobo and a caldo de pollo with matzo balls. Do note that the menu is a liberal interpretation of the Passover dietary rules, with beans, rice, and corn all included. The dinners begin at 6:30pm both evenings, and tickets cost $70 per person, including tip but not beverages. While we’re at it, it’s also the season for the colomba di Pasqua (Easter dove), which is like a panettone studded with candied citrus, and then topped with almond paste, sugar crystals, and almonds. ~EMPORIO RULLI~ sells a small one for $32 and a large for $45. Let me tell you, it’s a special thing to warm up for Easter brunch. The folks at ~MARLA BAKERY~ will also be baking hot cross buns (four for $12) and a colomba di Pasqua (made with house-candied citrus, golden raisins, and candied almonds) for $30. And don’t forget they make some incredible housemade organic matzo for Passover, with olive oil and salt flakes (three-pack for $9). 3619 Balboa St. at 415-742-4379. The brand-new The Yard in Mission Rock hosted rock band ~The Mowgli’s~ last Wednesday before they played a sold-out show at The Independent. The band enjoyed beers on the patio on the bay, and even snapped a photo.